Home fitbit Fitbit Charge 3 vs. Fitbit Versa: Which one should you choose? Fitbit’s latest fitness tracker is the Charge 3, and it comes packed with smartwatch capabilities. 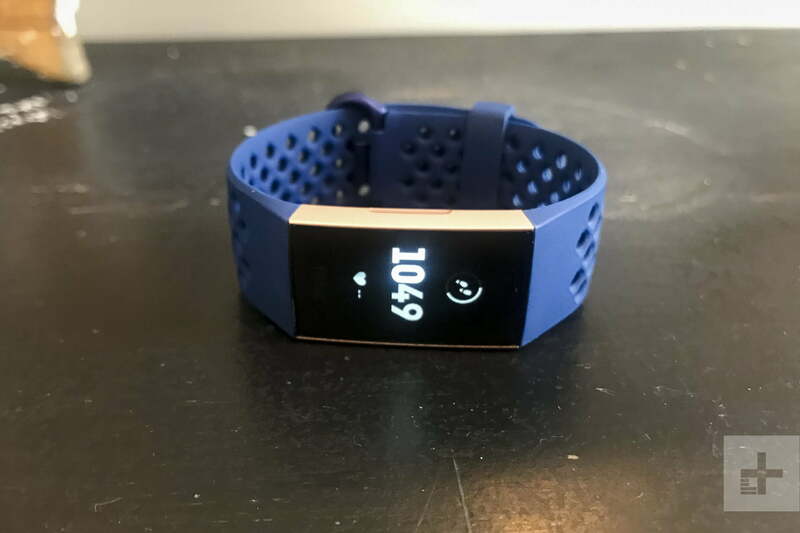 It also arrives only a few months after the company released the Fitbit Versa — which acts more like a smartwatch than any of Fitbit’s other wearables on the market. 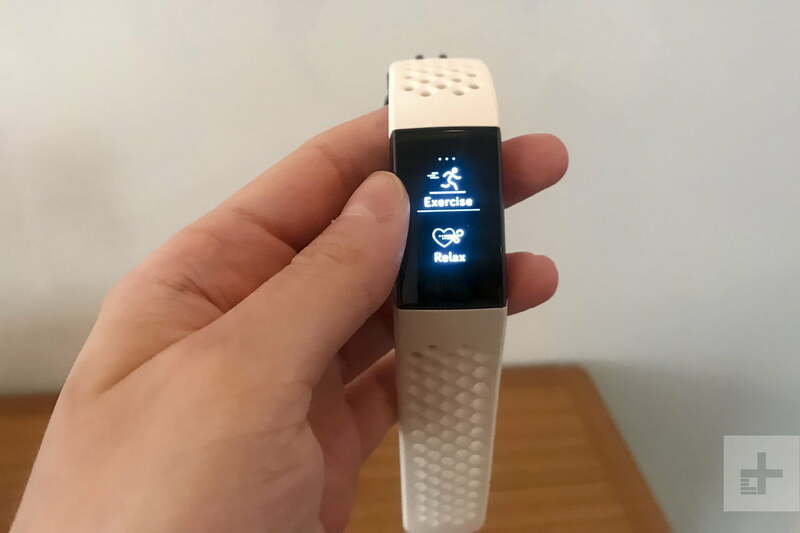 In addition to tracking health and fitness, both wearables deliver app notifications, the ability to view and reply to text messages, and the option to accept or reject calls, all from your wrist. Some people prefer smartwatches and others prefer fitness trackers. But what happens when you have a choice between two watches that offer both in one device — especially when there’s only a $50 difference that stands between them? Below, we pit the Fitbit Charge 3 versus the Fitbit Versa to find out which one is worth the investment. The Fitbit Charge 3 and the Versa are almost identical when it comes to specs. Each one includes a 3-axis accelerometer, altimeter, optical heart rate sensor, and Fitbit’s SPO2 sensor to monitor blood oxygen levels. The Versa also includes a 3-axis gyroscope that helps to improve how some of the fitness features work, while the Charge 3 does not. Other similarities the wearables share include the fact that they’re both swim-proof up to 50 meters. You can go for a swim or shower without having to worry about ruining either wearable. On the Charge 3, there’s also a swim mode that will show you real-time duration. Neither the Versa or the Charge 3 include built-in GPS, so you’ll have to stay tethered to your phone to track any running or biking sessions. The Versa offers the ability to run smartphone-free by using the Pandora or Deezer app to listen to music on. The Charge 3 currently doesn’t offer any music capabilities, but the company is looking to add music controls and third-party apps in the future. Even though the Versa does come with the ability to download more apps and store music on the device, the Charge 3 should eventually receive similar features in the future. Overall, the majority of specs are the same, but the Versa edges a narrow win. There’s no denying the Fitbit Versa looks extremely similar to the Apple Watch — in fact, we think it looks slightly better. With a 34mm display, it’s almost twice the size of the Charge 3 and the case is also extremely slim. Playing off its name, it’s also versatile and customizable enough to wear both day and night. But the Charge 3 does pull a lot of design inspiration from the Versa, specifically the aerospace aluminum case and streamlined design that make both wearables look sleek. We like that the Charge 3 also has a sleek look, and is even lighter at 29 grams — but it does have a smaller display and thicker case. We are fans of the inductive button with haptic feedback because it provides a “button-less” design that made it look even better. While both wearables also include interchangeable watch straps, it’s far easier to change them on the Charge 3 thanks to an easy release button that’s better than the quick-release pins on the Versa. In terms of display, the Versa features a larger, LCD touchscreen that’s vibrant and filled with pops of color. Meanwhile, the Charge 3 has a grayscale OLED display that isn’t as lively and exciting. 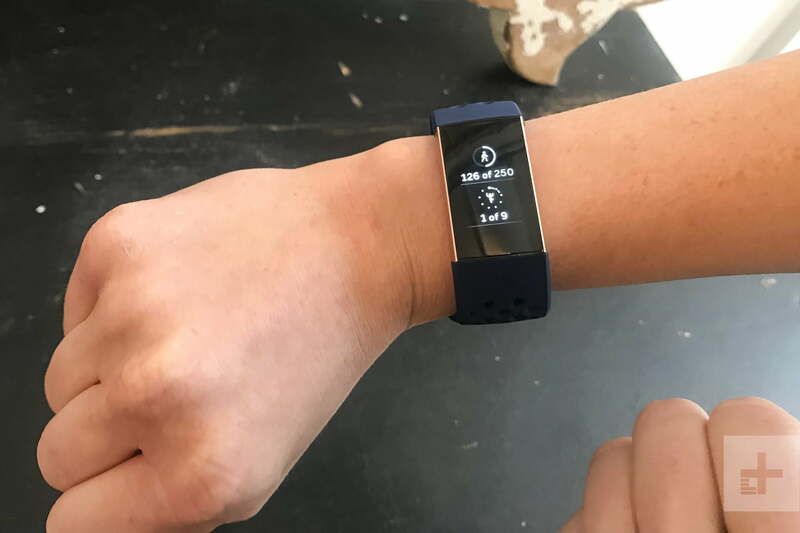 Both include a touchscreen display, which operates the same — swipe up for personal insights, to the left for exercise modes and apps, and down for app notifications. This is also where you can tap to reply to text messages for those who have an Android device. In the end, we like that the Versa not only has a large, bright display — and that we’re able to mask the fact that it’s a fitness tracker. The Charge 3 is far tougher to disguise. The Fitbit Versa and Charge 3 include almost all the same fitness-tracking capabilities — they track your metrics, use SmartTrack to automatically recognize workouts, measure heart rate, and there’s also female health tracking that can be added to the dashboard. One main difference that might be a deal-breaker for some is the Charge 3 doesn’t list as many fitness stats on its display. 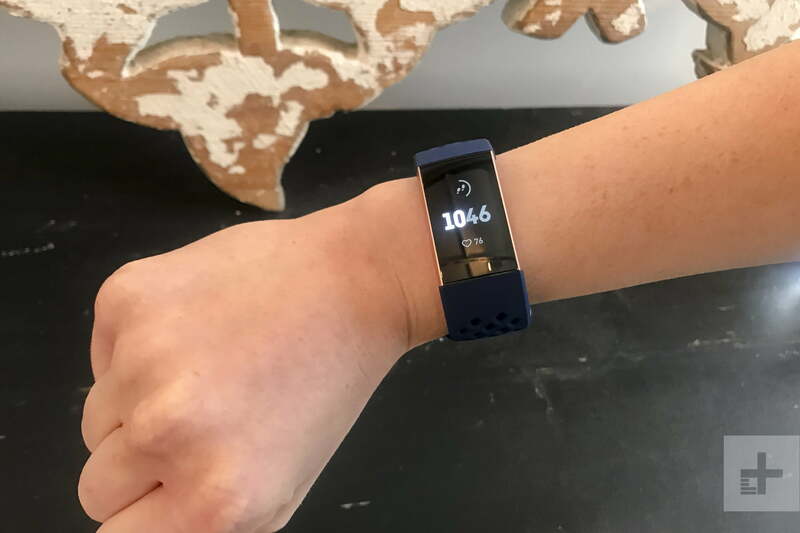 With the Versa, you can see an overview of your calories burned, steps taken, heart rate, and more over a seven-day span. The Charge 3 also won’t show you your last workout — it only shows you the current day, so you’ll have to refer to the Fitbit app for the rest. The Charge 3 includes a new feature called goal-based exercise modes. This allows you to choose whether you want to run a specific distance, burn a particular number of calories, and more. For example, if you set the goal as a two-mile run, the Charge 3 will let you know how much distance you have left to cover. There’s also an auto-stop feature that runners will appreciate — every time you stop at a traffic light during a run, the Charge 3 automatically pauses exercise mode until you start running again. This will allow you to track your runs more accurately, without having to constantly stop and start your wearable. The Versa does provide a more in-depth overview of stats but the Charge 3 wins this one. Even though the additional fitness features are minor, it’s the little things that make for an overall better workout experience. Since the Fitbit Versa is a smartwatch, one of its main appeals is its four-day-long (or longer) battery life. Most other smartwatches don’t last as long. In our review, the 145mAh battery lasted us about about three and a half days before running out of juice. But we did use it far more than we would on a daily basis, since we were testing out every single feature. Regardless, we still found that it lasted us almost the four full days Fitbit claimed it would. On the other hand, Fitbit says the Charge 3 will last up to seven days. While it does have a smaller battery, 71mAh to be exact, it’s powering a smaller, less-graphic-intensive display, which doesn’t drain it as much. When we tested the Charge 3, we ran out of juice on the morning of the seventh day — so it lasted us six full days before dying. But as with the Versa, we did use it far more than we would on a daily basis, so it could last even longer. Either way, we’re going to give this one to the Charge 3 since it was able to last us almost four days longer than the Versa. The Fitbit Versa will cost you $200, while the Special Edition — which includes an NFC chip for Fitbit Pay — costs $230. As for the Fitbit Charge 3, the fitness tracker will cost you $50 less at $150 and the Special Edition is priced at $170. Both are available for purchase. With the Charge 3, you can purchase the Special Edition version and still pay less than you would for the regular Versa. You’ll still receive all the same smartwatch notifications, the ability to send quick replies, and additional fitness features the Versa doesn’t include — all for a cheaper price. The one thing you will sacrifice is design. 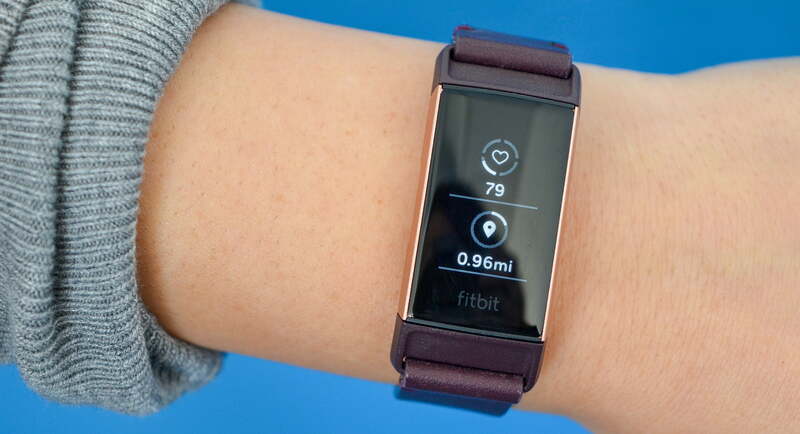 Fitbit’s wearables place health and fitness at the top of the priority list. While the Fitbit Versa looks more impressive when it comes to both hardware and display, the Charge 3 will give you a better fitness experience. 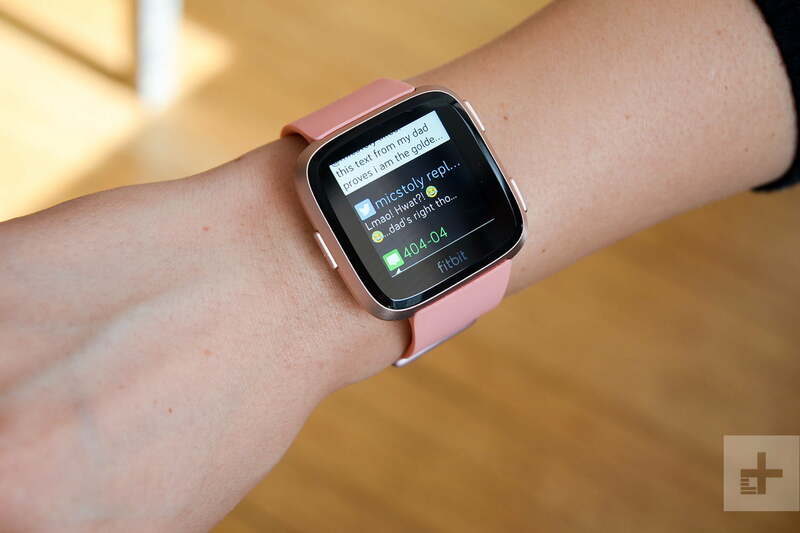 You’ll also have the same smartwatch capabilities — you can receive and answer text messages, get social media notifications, and accept or reject calls. The fitness features are almost identical — both Versa and Charge 3 owners have access to their own personal dashboard on the display, automatic exercise recognition, and connected GPS — and both are also swim-proof. But the Charge 3 also packs in a few additional perks. With goal-based exercises, auto-stop mode, touchscreen display, and a comfortable inductive button — all within a lightweight and sleek device — the Charge 3 offers more for a bit less.